Whew, three weeks down already. :) You can see links to the complete series here, and read about my Lowe's gift card giveaway here. In this series, we're seeing what we can make out of 2x4s. I want to keep it cheap, keep it easy, and keep it totally doable for anyone. 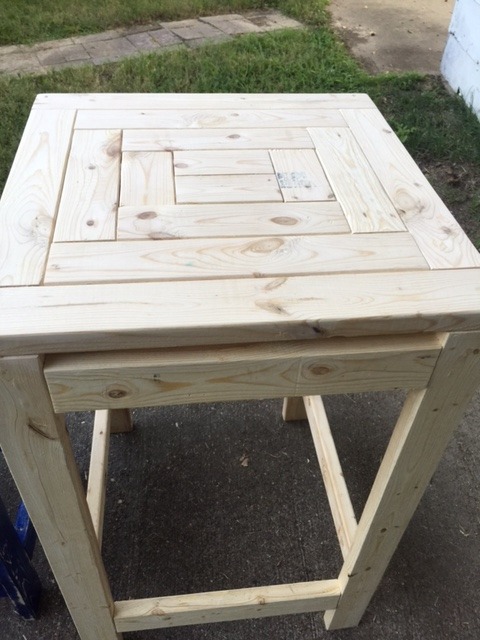 Most of our projects so far have been pretty modern, but today we're going to mix it up a little with a Craftsman Style End Table. 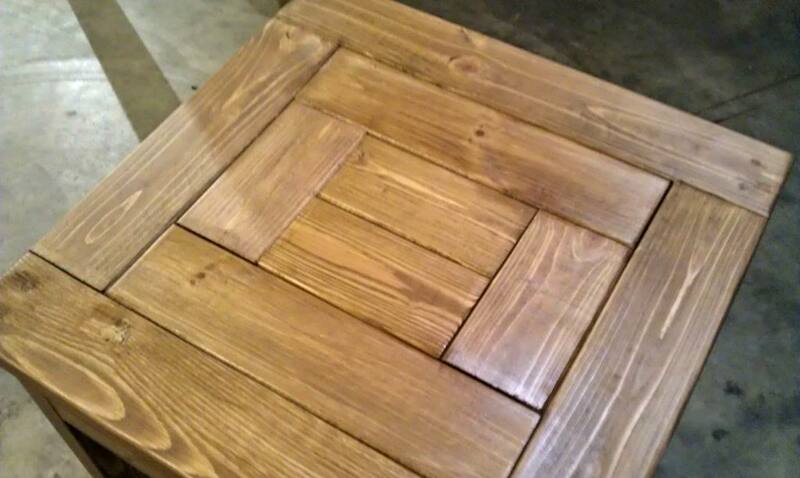 This table has a more traditional style and a patchwork tabletop. It's a great size to use by the couch or your favorite reading chair. Big enough to hold a lamp, a couple books, and of course a snack but compact enough to work in smaller spaces. Tuck a basket underneath to stash extra blankets, toys, or magazines. 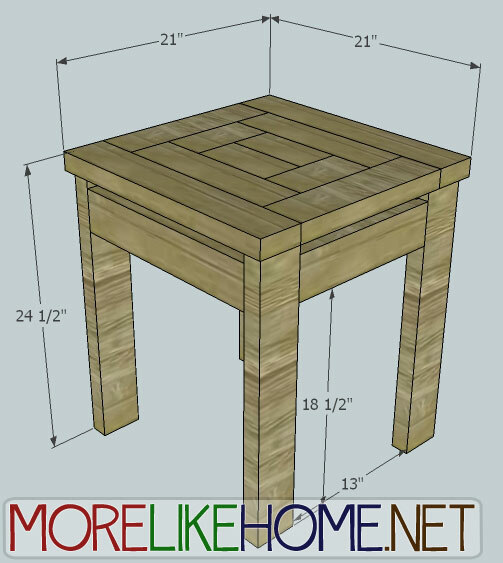 Ready to build an end table? Please read all the directions before beginning, and cut your pieces as you go, measuring before each cut. Use 2 1/2” screws or pocket holes with 2 1/2" pocket screws unless otherwise indicated. Always use glue. Pre-drill and countersink your screws. I have not built from these exact plans, so measure lots to make sure things work out! Now attach two of the top (B) boards across the long sides of the top. This will make the top square again. Now attach the top (C) pieces across the long edges. Now your top should be square again. Use one side board (E) to connect two legs (D) as shown below. 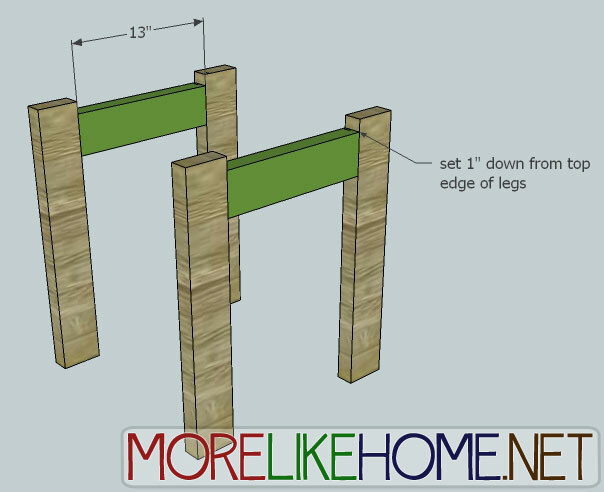 The side boards should be set down 1" from the top of the legs. Use a Kreg Jig to attach the side, or drill through the leg into the ends of the side board with 4" screws. Use glue. Repeat to build the other side. Now use the front/back boards (F) to connect the two side sections as shown below. They should be set down 1" from the top of the legs, and flush with the outside edges of the legs. 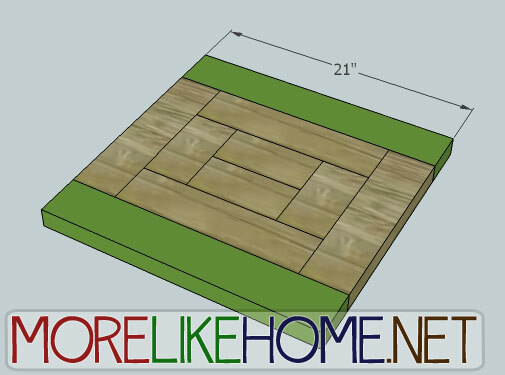 Use a kreg jig to attach the boards, or drill through the legs into the front/back boards with 2 1/2" screws and glue. 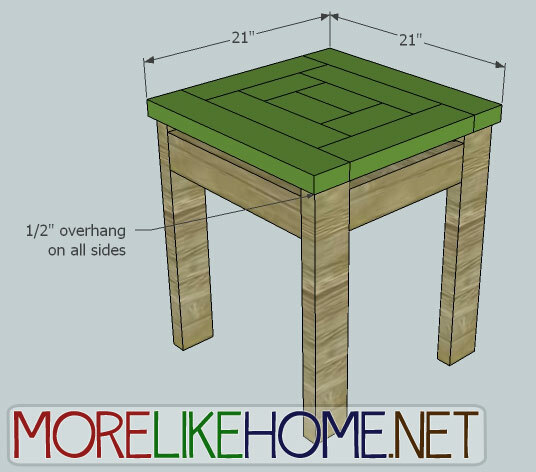 Check to make sure your table is square before you attach the top. 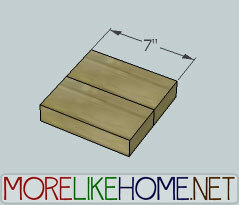 Measure diagonally from corner to corner in both directions - the measurements should be the same if the table is square. If it's not, just shift the table a little until they match. Now attach the top to the base. 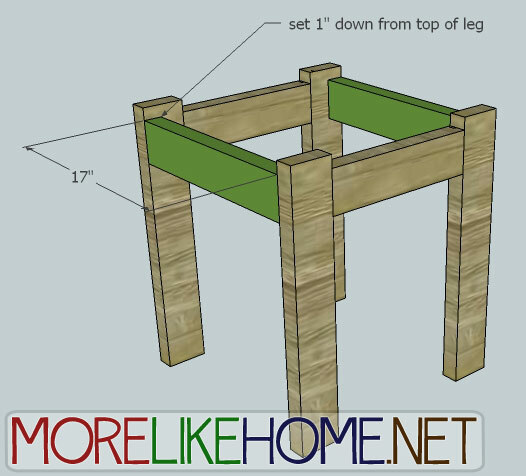 Drill down through the top into the legs and secure it with 2 1/2" screws and glue. Start by filling any holes and sanding everything smooth. Then just finish with any paint or stain and polyurethane you want. Keep the craftsman style with a rich stain, or give it a modern twist with a bright coat of paint. 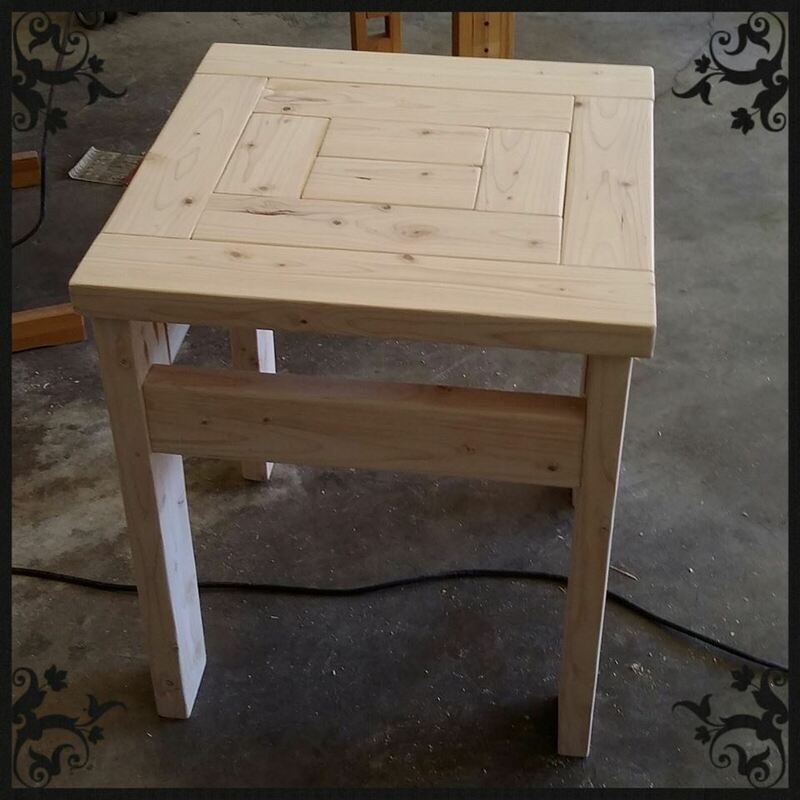 This is an end table built by Matt. Thanks so much for sharing, Matt! It looks wonderful! And here's one more by Holten. Beautiful work! Keep it up, guys! 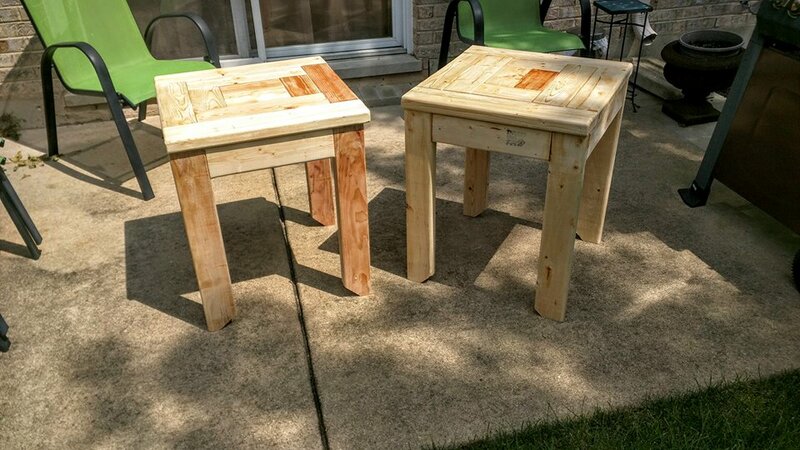 And this pair was built by Dave, who's been working his way through several projects in the 2x4 series. Rogers copied the tabletop to create a custom pub table. The top is 28x28" and the legs are 44" (although he plans to make them 42" next time). 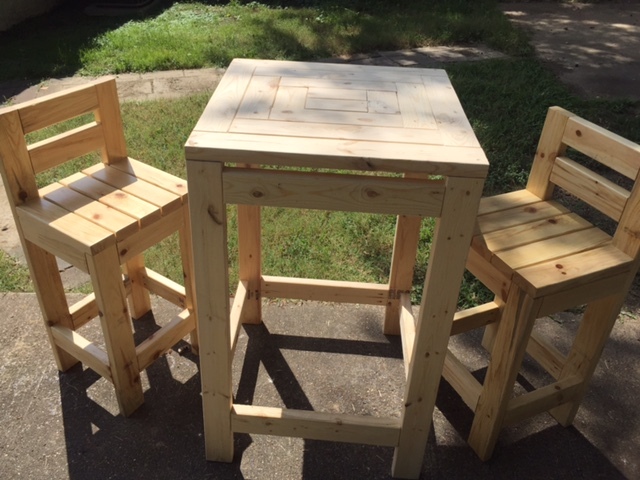 He finished the set with a pair of 2x4 Chunky Bar Stools. I like the space between the top and the top supports, but I'm curious. Is the space for style or support? This would be nice for a living room or bedroom. 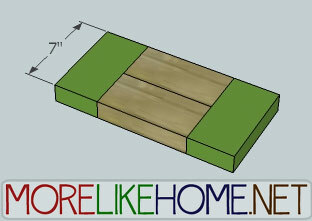 Love that the top of the end table as a bit of a design instead of just 2x4s straight across! Added to my project list! I was just picturing a table top like that last week! I like that you start in the middle so everything actually lines up. I made this to put a mini fridge on. Very simple design, completed it in just a few hours. 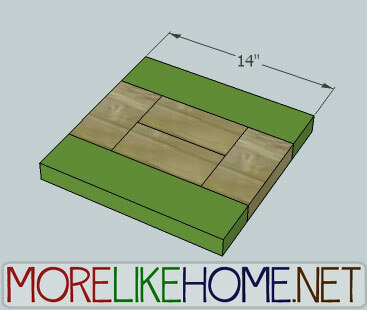 I'd love to build a matching coffee table. Don't have plans for that do you? I finished another one of your amazing plans and wanted to share it with you. This table came out great and I have you to thank for it. That is fine with me. Thank you again! I'm hooked on your site! Is there a printer friendly version of these plans? There isn't, sorry about that. I've had a couple people ask so I'm looking into it for future plans! 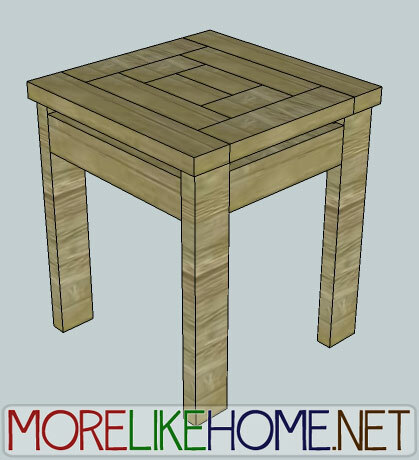 Shrunk down the dimensions for 2x3's and made a side table for each of my four patio chairs. Love it! And thanks for the pic, it looks great! I'd like to add a bottom to put books what are the measurements for that? 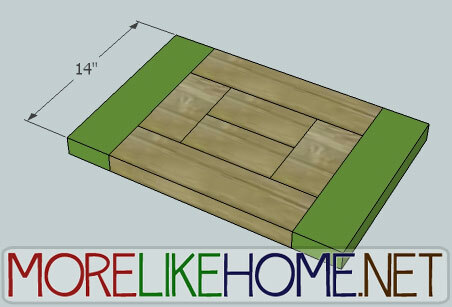 The easiest way would be to add another set of front/back boards and side boards near the bottom of the table. Then cut four 17" long 2x4s and attach them between the side boards with a 1/2" gap between each board (use a krej jig or screw through the side boards into the ends of the shelf boards). Good luck! Used your plans and turned out awesome! Going to build another to have a pair for my living room. How can I share a photo of my completed project? Love this plan. Just finished my first one and see several more in my future. I'm going to be building this little guy for my living room. 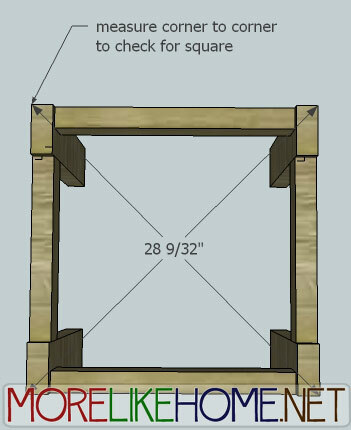 Since 2x4's have rounded edges, do you keep them as is for this project or would you run them through a table saw to get a cleaner 90 degree edge? If the 2x4's were left as is (with the rounded edges) I'd think that crumbs and dust would easily get trapped in between the boards. What route did you all take? I've gotten back to this after a hiatus. I decided to trim 3/16" off the rounded sides of the wood to make it easier to join the pieces flush. As expected, it threw everything off in terms of fit. Frustrating trying to figure out how to get everything to line up when deviating from the original measurements. Was 3/16" too much to remove? Hello..I am in the process of building this table right now but it seems like the 4" wood screws are not long enough...what am I doing wrong? Thank you. You could try using a countersink when drilling your holes or I'd personally use 4 1/2'' screws and also countersink if you aren't using a Kreg jig. The instructions call for attaching the top to the legs by drilling screws down into the end grain of the legs. Is there another way to join the two that's stronger, like using a Kreg jig? Screwing into end grain seems weak to me. That's what I ended up doing. Seems to work OK.
My son just made this for a 4-h project. We made a shelf using the same design as the top only smaller.